MDrumEnhancer, Virtual Percussion Synth from MeldaProduction. MeldaProduction has released update v9.05 for all their plug-ins as well as the new MDrumEnhancer plug-in. 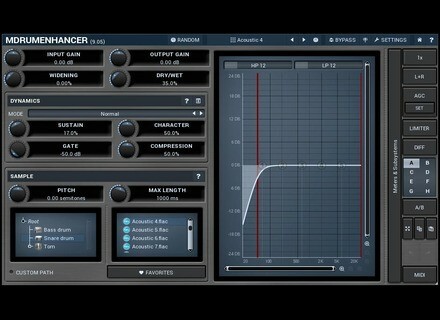 The MDrumEnhancer is an alternate solution to drum replacement: the processor tracks your drums and synthesizes its signal with samples to fatten the sound. 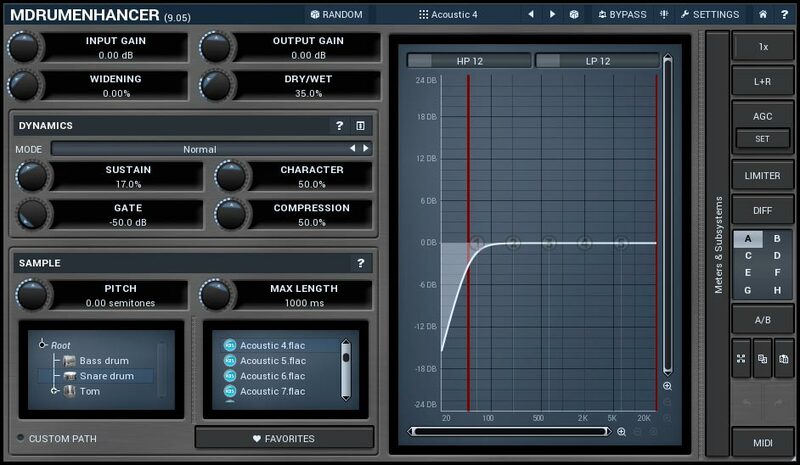 You can therefore use it to enhance a kick, add noise to a snare or completely change the sound by using resynthesis. You can choose between presets and samples and the GUI offers pitch and sustain controls as well as a dynamic EQ. The MDrumEnhancer, just like all other MeldaProduction plug-ins, includes 4 modulators, 4 multi-parameters, MIDI Learn, Mid/Sid and up to 8 channel surround processing, 16x upsampling and it includes an oscillator shaping technology. The VST 2/3, AU and AAX 32 and 64-bit plug-in for Mac OS X and Windows is available for the introductory price of 39 € / $43 instead of 149 € / $165 and you can download a trial version from www.meldaproduction.com. VSL launches Vienna Dimension Brass II VSL announces the release of a new Standard Library dedicated to brass instruments, the Vienna Dimension Brass II. Cakewalk updates Sonar to Foxboro version Cakewalk has released the Foxboro update for its Sonar DAW, which is available now for download.